yet our inner man is being renewed day by day." Was blessed to be a part of a men’s retreat the weekend of May 3rd – 5th, 2013 with my home church and wanted to share some reflections via this post. The location/venue (Twin Rocks Camp and Conference Center in Rockaway, Oregon) as well as the weather, accommodations, fellowship, etc. were fantastic!! The Speaker, Worship in song, break out groups were great as well and it turned out to be a weekend that had profound impact on many. We were challenged to connect with God in a way we’ve never connected with Him before – something I’d say as men that we’re not real good at sometimes even though deep down we hunger for true relationship. The speaker kicked off the weekend on Friday night by sharing his testimony and then during each of the sessions introduced a major theme of renewal and challenged us through the Scriptures and his recent journey with God to take time to pause with God. 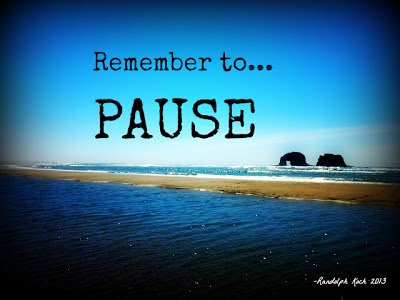 We were challenged to take time to be with God whether you pause for 2 minutes, 30 minutes or more. Taking time to read His Word, pray and listen for His direction. We were also reminded time and time again that we are not alone! It was a needful reminder (or for some it may have been the first time they heard these assurances) as we live in a busy and hurried world! I know how busy I get working and serving Him that I forget to do just this, pause to be with Him. In our breakout sessions where we met in small groups, the stories and testimonies started to unfold about the impact this was having on each of us. Little-by-little we became more transparent with where we’ve come from, where we are, and what lies ahead with personal changes we need to make and need help from God and others to do so. I know I wrestled with this question a bit myself and a couple things automatically came to mind as the speaker asked the question. I listened to others share during our small group time and then I shared a few things as well and It was evident that we are not alone in our battles and not alone with how we tend to think about God sometimes either. After our Saturday morning session and lunch we had about 4 ½ hours of free time before dinner and our evening session. After a hike with my son, he then wanted to relax at the camp so I decided to hit the beach, take a walk, snap some pictures and videos and relax / pause for a bit as I continued to process what God was teaching us. About 30 minutes before needing to head back I sat down to physically pause and hear from God. I drilled into this for a few moments and then I felt prompted to take a piece of paper from my notepad and write down the things that came to mind. Within less than literally 30 seconds to a minute I looked down and realized there were 10 things listed there – 10 major things and sadly I think I could have kept going! You see, I realized why it hit me and it’s not only because of my past, but it seemed to drill down to penetrate the core of my heart and soul with the realization that how I view myself – the lies I believe about myself – directly reflects on how I view God! Why?...Because He made me (all of us) in His image and His Word states clearly who I am in Him and how He sees me! I have no business believing these things about myself! The list that I wrote down - literally boiled down to trust for me and due to my past, trust is a big issue for me…especially but not limited to other men, male leaders, friends, or male role models. So, I have to continually learn how to trust God (and others) – trust that He loves me unconditionally like He says and has shown that He does, and that everything He says that I am in Him and how He clearly states how He’ll never leave or forsake me and that He’ll provide, etc for me throughout His Word is true and that I can completely trust HIM! For years I have put up barriers and have had a low self-image because of my past. I have continually had to learn about who I am in Him and that the lies I speak of or think about myself are just that - lies! As I reflected on all of this, I was then led to turn that list sideways and right the word LIES over the entire list in large letters. Next I was prompted to burn that list up and as I watched the list of lies burn up, line-by-line, before me I realized that I don’t need to dwell on or receive them anymore because I know the truth and need to live in His unchanging truth about who I am and who God says I am! I cannot allow myself to believe the lies about God or myself any longer and pray that with God’s help I will allow the lies that were represented on that list and more too truly disappear! For me it was a simple yet powerful moment as I released things I had hung onto for far too long and they were and are barriers to walking fully in the newness of life He desires for me. I ask you to pray for me as I continue this journey and walk with Him that I’d truly let go of these lies once and for all and in place of them, believe the truths about Him and myself that are so clearly laid out in his Word! I challenge you to do the same and start by asking God for help identifying what lies you believe about Him as well as yourself and then confess those things, let them go, and move forward in His name, love and grace! The next day (Sunday) which was our final retreat day and session we had a special and moving time of communion to close our time together. For me this was a very fitting end to the weekend as we celebrated the Lord’s Table which is a great time to celebrate what He’s done for you and I but also that we can take time to lay the burdens down before Him as He works in our lives. During special times of personal retreat or special serve efforts such as a mission trip or other significant life event, we have what we often refer to as a “Mountain Top Experience”. Much like others throughout history who had significant things happen through such experiences we can and do have tremendously moving events take place during these times. The hope always is that through those “Mountain Top” times that those momentary events, once “off The Mountain Top”, would lead to lasting life change! I believe and my prayer is that per my own experience and others experience through this specific time that this will be the case! The end of this weekend was truly the beginning of a fresh new perspective for myself and many others I suspect and I’m excited to see what changes and new things come for myself and others as we strive to walk in newness and let the old life, the old things, the lies disappear. I’m very thankful for the very simple, contemplative and profound weekend and pray that the effects of the learnings of the weekend aren’t temporal but truly become life altering and lasting changes for everyone, including myself that attended. Take Time to Pause – Pause Often and Regularly: Seek God regularly! Take time to connect with Him. Whether it’s in 2 minute intervals throughout the day to longer times, it’s vital that you and I invest this time with God seeking Him and listening for His direction. Take Inventory: Ask God to help you take inventory of your journey from time-to-time. Assess what lies you’re believing about God and yourself. Take Time to Connect with Others: Building relationships is an important aspect of your journey especially in the context of your spiritual life as well as life in general. We weren’t designed to do life alone and we need the help of others to rise above where we are and to move forward. How often do I take time and connect with God? What is the lie (or the lies) I believe about God? What is the lie (or the lies) that I believe about myself? What do I need to do / need God’s help to do in order to move forward more fully in the newness of life He desires for me?